… for at least 15 minutes. I even needed sunglasses during those 15 minutes. Given that I left my sunglasses in my car in SoCal, I should be glad that the big dark heavy rain laden clouds returned promptly. Today was Mom and I’s last full day in Ireland for this trip. 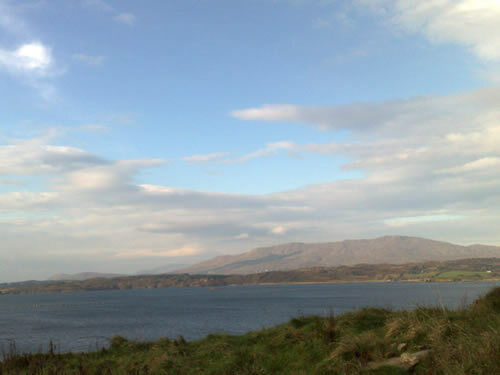 We ventured southwest from Letterkenny to Glenties and then down the N-56 to the N-14 via Donegal town to Sligo. Most of the drive was lovely. The above photo was taken on the small, one lane road to St. John’s Point. While in the Sligo area, we visited the Creevykeel Goort Cairn, Strandhill Beach with surfers (to quote one after Mom asked after the water temps, “It is feckin freezing!”), and then off to Carrowmore Megalithic Tombs just before sunset. The sky was completely dark by 4:30pm and we were off down the N-4 to Dublin. Tomorrow we fly back to the UK for the last week of the trip. by Ms. Jen on Tue November 20, 2007 | Permalink | ah, ireland.